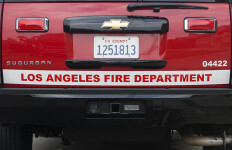 A leak from a 9,000-gallon gasoline tanker caused the vehicle to catch fire, which spread to one nearby home, and ignited the atmosphere in storm drains, injuring two people and sending a huge plume of smoke into the sky over South Los Angeles Sunday morning. Firefighters responded to a call at 7:45 a.m. about the smell of gas in the air at 216 W. Slauson Ave. Arriving units found the leaking tanker, and when fumes came into contact with an unknown ignition source the tanker exploded into flames, forcing firefighters back. A manhole cover was displaced when fumes in the storm drain ignited and created underground pressure, according to Capt. Cody Weireter of the Los Angeles Fire Department.